Winning at a Loser's Game? Control, Synergy and the ABInBev/SABMiller Merger! I have been a long time investor in ABInBev, though I became one indirectly and accidentally, through a stake I took a long time ago in Brahma, a Brazilian beverage company . That company became Ambev in 1999, which in turn was merged with Interbrew, the Belgian brewer, in 2004, and expanded to include Anheuser Busch, the US beer maker, in 2008 to become the largest beer manufacturer in the world. I made the bulk of my money early in my holding life, but Amber has remained in my portfolio, a place holder that provides me exposure to both the beverage business and Latin America, while delivering mostly positive returns. It was thus with trepidation that I read the news report in mid-September that ABInBev (which owns 62% of Ambev) had approached SABMiller about a takeover at a still-to-be-specified premium over the the latter's market value. While it is entirely possible to create value from acquisitions, I have argued that creating growth through acquisitions is difficult to do, and doubly so when the acquisition is of a large public company. Since ABInBev's control rests with 3G Capital, a group that I respect for its investment acumen, it would be unfair to prejudge this deal without looking at the numbers. So, here we go! The first casualty in deal making is good sense, as the fog of the deal, created by bankers, managers, consultants and journalists, clouds the numbers. Not only do you see "control" and "synergy", two words that I include in my weapons of mass distraction, thrown around casually to justify billions of dollars in premiums, but you also see them used interchangeably. When you acquire a company, there are three (and only three possible) motives that are consistent with intrinsic value. Undervaluation: You buy a target company because you believe that the market is mispricing the company and that you can buy it for less than its "fair" value. In effect, you are behaving like any value investor would in the market and there is no need for you to either change the way the target company is run or look for synergy benefits. Control: You buy a company that you believe is badly managed, with the intent of changing the way it is run. If you are right on the first count and can make the necessary changes, the value of the firm should increase under your management. If you can pay less than the "changed" value, you can claim the difference for yourself (and your stockholders). Synergy: You buy a company that you believe, when combined with a business (or resource) that you already own, will be able to do things that you could not have done as separate entities. Broadly speaking, you can break synergy down into "offensive synergies" (where you are able to grow faster in existing or new markets than you would have as standalone businesses and/or charge higher prices for your products), "defensive synergies" (where you are able to reduce costs or slow down/prevent decline in your businesees) and "tax synergies" (where you directly take advantage of tax clauses or indirectly by being able to borrow more money). Acquisition Price: This is the price at which you can acquire the target company. If it is a private business, it will be negotiated and probably based on what others are paying for similar businesses. If it is a public company, it will be at a premium over the market price, with the premium a function of the state of the M&A market and whether you have other potential bidders. Status Quo Value: This is the value of the target company, run by existing management and based on existing investing, financing and dividend policies. Restructured Value: This is the value of the target company, with changes to investing, financing and dividend policies. Synergy value: This can be estimated by valuing the combined company (with the synergy benefits built in) and subtracting out the value of the acquiring company, as a stand alone entity, and the restructured value of the target company. Connecting these numbers to the motives, here are the conditions you would need for each motive to make sense (by itself). 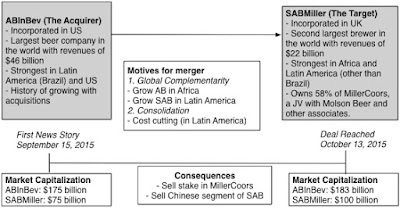 Which of these motives, if any, is driving ABInBev's acquisition of SABMiller, and whatever the motive or motives, is the premium being paid justified? To make that assessment, I will compute each of the four numbers for this deal. There were two key reasons provided to rationalize the potential deal. The first is geographic complementarity, since these two companies overlap in surprisingly few parts of the world, given their size. ABInBev is the largest player in Latin America, with Brazil at its center, and SABMiller is the biggest brewer in Africa. 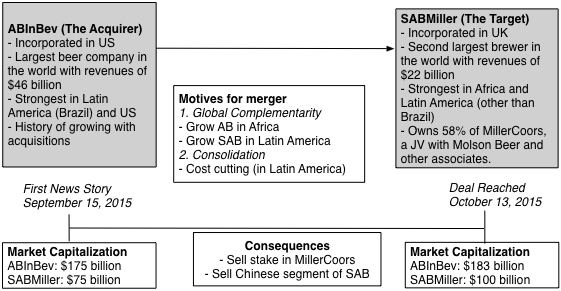 SABMiller’s Latin American operations are outside of Brazil, for the most part and while ABInBev has significant North American operations, SABMiller's North American exposure is entirely through its Coors Joint Venture. While no specifics are provided, the basis for synergy seems to be that after this deal, ABInBev will be able to expand sales in the fastest growing market in the world (Africa) and that SABMiller will be able to increase its revenues in the most profitable market in the world (Latin America). The second is consolidation, a vastly over used term that often means nothing, but if it tied to specifics, relates to potential costs savings and economies of scale. While the absence of geographic overlap may reduce the potential for cost cutting, ABInBev can use the template that it has used so successfully on prior deals (especially the Grupo Modelo acquisition) to cut costs in this acquisition as well. There are also negative consequences that follow from this deal. The first is that when anti trust regulators in different parts of the world will be paying close attention to this deal, and it seems likely that SABMiller will be forced to sell its 58% stake in MillerCoors and that Molson Coors, the other JV partner, will be the beneficiary. The second, and this adds to the pressure, ABInBev has agreed to pay $3 billion to SABMiller if the deal falls through. In summary, though, the challenge is a simple one. ABInBev is paying a $29 billion premium to acquire SABMiller. Is there enough value added to ABInBev's stockholders that they will be able to walk away as winners? Looking past the numbers, it is worth noting that not only does ABInBev has a history of growing successfully through acquisitions but that its lead stockholder, 3G Capital, is considered a shrewd allocator and steward of capital. The numbers reinforce my earlier point about geographic complementarity at least at the parent company level, with ABInBev getting a large percent of its Latin American sales in Brazil and SABMiller getting most of its Latin American sales from countries other than Brazil. Bottom line: To me, SABMiller does not look like it is priced to be a bargain, even at the pre-deal price, and definitely not at the deal price. This comparison may be simplistic, but it looks like SABMiller lags the sector is in its reinvestment rate and return on capital, and that it earns a profit margin that match up to the sector. It also has a debt ratio that is not far off from the sector average. ABInBev has a much higher profit margin than the rest of the sector and pays a lower tax rate. I revalued SABMiller with the return on capital, debt ratio and reinvestment rate set equal to the industry average. (I considered using ABInBev's operating margin but much of that comes from Brazil and it is unlikely that SABMiller can match it in South Africa or the rest of Latin America. Bottom line: Changing the way SABMiller is run adds about $4.7 billion to the value, but even with that addition, the equity value of $56.2 billion is still far below what ABInBev paid on October 15. That suggests that control was not the primary rationale either. It is possible that I have been too pessimistic about the potential cost savings or growth possibilities, but given the history of synergy in big deals, I think that I am being optimistic. Based on my estimates at least, the value of synergy in this deal is $14.6 billion (and that is assuming it is delivered instantaneously). Bottom line: If synergy is the motive for this deal, a great deal has to go right for ABInBev to break even on this deal, let alone create value. The history of 3G Capital as successful value creators predisposed me to give them the benefit of the doubt, when I started assessing the deal. After looking at the numbers, though, I don't see the value in this deal that would justify the premium paid. It is possible, perhaps even likely, that there is some aspect of the deal, perhaps taxes or other benefits, that I am not grasping. If so, I would encourage you to use my template, change the numbers that you think need to be changed, make your own assessment and enter them in this shared Google spreadsheet. It is also possible that even the smartest investors in the world can sometimes let over confidence drive them to over react. Time will tell! This is the third and final post in a series of three on the ride sharing business. In the first, I valued Uber and looked at the evolution of its business over the last 18 months. In the second, I valued Lyft and looked at pricing across ride sharing companies. In this one, I look at the future of the ride sharing business from the perspective of an outsider with no expertise in this business. In my last two posts, I first valued Uber, with its expansive narrative, and then looked at putting numbers on Lyft's less ambitious storyline. In my Uber post, I argued that the ride sharing market was proving to be bigger, broader and growing faster than I had estimated it would be in June 2014. In the Lyft post, I examined how VCs were pricing ride sharing companies. In this post, I want to complete the story by looking at the current state of the ride sharing market and for scenarios for the market over time, with consequences for investors, car riders and drivers. Anecdotal & Qualitative evidence: I am usually wary about using anecdotal data but I have been keeping tabs on Uber usage in my travels and I have been amazed at the company's global reach. This summer, I did seminars in São Paulo, Moscow and Mumbai, and in each venue, a significant proportion of the attendants had taken Uber to the event. In fact, my children talk about Ubering to destinations unknown, rather than taking a cab, just as xeroxing and googling became synonyms for copying and online searching. Operating metrics at ride sharing companies: The operating metrics at the ride sharing companies individually, and in the aggregate, back up the proposition that this is a high growth business. Investor expectations: The increases in the values attached to ride sharing companies indicate that investors are also scaling up expectations of future growth in this business. Using Uber's estimated value of $51 billion in its most recent VC funding to illustrate the process, I estimated imputed revenues of $51.4 billion in 2026, which, if you hold its revenue slice share at 15% (my assumption) yields an imputed gross billing of $342.8 billion in 2026. If I repeat this exercise with the other ride sharing companies, the collective revenues being forecast by investors may exceed attainable revenues, an example of what I termed the big market delusion. The growth in ride sharing has been accompanied with more intense competition and rising costs, as can be seen in the large and growing operating losses reported by the companies in this business. The reasons for these losses are manifold, as I noted in my Uber post. Some of the costs come from intense competition for drivers and customers, with companies following the Field of Dreams model, that Amazon has used to such effect in the last decade. Some costs come from outside, higher insurance costs and employee expenses, as ride sharing companies go from being fringe players to larger businesses. Some costs flow from legal fights with regulators, licensing agencies and other rule-writers, whose desire to control the business clashes with the market-driven imperatives of ride sharing. The optimistic view is that these costs will become smaller as companies scale up, but will they? As revenues scale up, the number of drivers will increase proportionately, and unless the competition disappears, the costs of fighting for drivers and customers will continue. In brief, the existing ride sharing model looks like a long term money loser, unless something fundamental changes. At the risk of playing market prognosticator in a market where I am a novice, I see four possible scenarios that can unfold in this market, all possible, but perhaps not equally probable. Winner-takes-all: The big prize in many technology businesses is that there is a tipping point, where the winner ends up capturing much of the market. That is the template that Microsoft used two decades ago with MS Office to capture the business software business and that Google used to scale the heights of online advertising. The payoff to such a strategy is that you not only control the dominant market share but that you get pricing power (and higher profits). It does seem to be the strategy that Uber is following in the ride sharing business, but there remain three road blocks that may get in the way. First, you have to remove your competitors from the playing field and while Uber had the cash buffer and capital raising upper hand last year, that advantage has narrowed as a result of partnerships and new capital flowing into other ride sharing companies. In a perverse way, Uber's best chance of succeeding at this strategy is if there is a hitch or stop in the flow of capital to tech companies, though that may work against its objective of going public in the near future. Second, you have to navigate your way through the anti trust and monopoly questions that will inevitably follow, not an easy or an inexpensive task, as Google and Microsoft have discovered over the last decade. Third, while technology remains a focal point for ride sharing companies, the car service or logistics business needs physical infrastructure, making it more difficult to preserve global networking benefits. The Losers' Game: While the winner-take-all is alluring, its logical conclusion, if you have multiple players pursuing it, and none winning, is that you can make the business a loser's game, one in which the market grows as promised and companies generate high revenues, but make very little in profits. A big business can sometimes be a bad one, as I noted in this post on bad businesses and why companies in these businesses continue to invest and grow in them. The Divide and Rule Game: As the old colonial empires discovered a few centuries ago, and the Sicilian crime families realized in the late 1920s in the United States, the most profitable end game, when competition is cut-throat (literally), is to negotiate a truce, where the spoils are divided up and each competitor is given control of a segment. In the ride sharing market, if the business boils down to two or three large players, they may be able carve up the global market and each player will get a free run in their carved up portion . This will be, of course, terrible news for drivers and customers and may attract regulatory or legal scrutiny, but for investors collectively, it will be most value-adding scenario. There are two potential weak links. The first is that this truce, by its very nature, will not be a friendly one and small violations can lead to it unraveling. The second is that it rests on the premise that there is no outside party that is powerful enough to step in and take advantage of the soft spots in the market. The Game Changer: I believe that the existing ride sharing model is an unstable one. As I argued in my post on Uber, the very strengths of the models (bare bones infrastructure, drivers as independent contracts and no car ownership) makes it unsustainable in the long term, since ride sharing companies have to compete for drivers on a continuous basis, offering them incentives to switch from competitors, and customers, with special deals. It is therefore likely that a new model will emerge, though it remains an open question of whether it will come from one of the players in the game, or from an outsider. Thus, Uber's hiring of robotics engineers may be a precursor of a different ride sharing game, with driverless cars and infrastructure investments, or it may be Google or Tesla who enter the picture with a different way of operating this business. If these scenarios remind you a little little of the prisoner's dilemma, where two rational individuals are given a choice between cooperating and competing, there are parallels. Consider one possible version, where the ride sharing companies globally boil down to two competitors: Uber, as a global ride sharing behemoth, and the Not-Uber, an alliance of national ride ride sharing companies (Ola+Didi Kuaidi + GrabTaxi + Lyft..). The box below captures the possible outcomes of this game, which will get infinitely more complicated if there is an outsider player lurking on the fringes. Based on my very limited knowledge of the companies in this space, I would give the highest odds to the ride sharing business becoming a loser's game, attach about equal probabilities to it becoming a winner-take-all or a game changer emerging, and see the least chance that the ride sharing companies will collude to maximize profits and value. There are others, who know more about this business than I do, who see this game evolving differently over time. Mark Shurtleff at Green Wheels Mobility Solutions, the ride sharing expert that I referenced in my last post thinks that I am being too pessimistic on some counts and perhaps too optimistic on others and feels that there are small start ups that are finding a better business model than the big players. There are some who believe that I am underestimating the pull of the familiar and that ride sharing companies, once established, will be difficult to displace. 2. Failure and False Hope With each misstep by a ride sharing company (and Uber in particular), whether it be an employee with a loose tongue or a assault by an Uber driver, the hope that this misstep will put an end to the ride sharing business rises among taxi operators and regulators. However, only the most delusional among these hold on this hope. 3. Imitation and Institutional Inertia In the mistaken belief that all that separates the ride sharing companies from conventional car service is an app, taxi operators have turned to putting apps in the hands of drivers and customers. At the same time, any attempts to introduce flexibility into the existing car service business are fought by politicians, regulators and some of the operators who benefit from the current structure. 4. Regulation, Rule Rigging and Legal Challenges This seems to be the place where car service companies are making their stand, aided and abetted by regulators, courts and politics. By restricting or even banning ride sharing, they are slowing it’s growth but as I see it, the fight is on its way to being lost, since it is the customers who ultimately will determine the winner in this game, and they are voting with their dollars. 5. Acceptance and Adjustment It may be slow in coming, but a portion of the conventional car service business is adjusting to the new reality, sometimes because they realize that it is a fight that is unwinnable and sometimes because the financial hill is getting steeper to climb. This is especially true for cab operators who have borrowed much or most of the money that they used to buy medallions and are discovering that they cannot pay their debt. So what does the future hold? Will there be no taxi cabs left on the streets of New York, London and Tokyo in a few years? I think that the taxi cab business will shrink, but not disappear, and that it will retain a portion of its business in those public spaces where regulators have the most say, airports, train stations and public arenas. If this is the future, it is also clear that there is more pain to come and it will take the form of continuing decline in taxi cab revenues and market capitalization at these companies. As for the private car service business, it will either adapt and share revenues with the ride sharing companies (which still needs cars and drivers) or focus on corporate relationships (offering discounted and on-demand services to companies that do not want their employees using multiple ride sharing services). Coming soon to a business near you? As I watch the traditional taxi cab business flailing and ride sharing companies grow at their expense, and am tempted to pass judgment on the inability of those in the business to adapt to the world that they live in, there are two general lessons that come to mind. From the disruptor's standpoint, I think that the success of Uber and its peer group in changing the car service business is a reminder that existing business models can be disrupted in short order by new technologies, but the collective losses reported by these companies are also a reminder that making money on disruption is much more difficult. Looking at the same process from the perspective of the disrupted, it is a reminder that the pain inflicted on the car service business could very easily be coming to the business that you are in. If you are in the financial services business, the entertainment business or the health care business, all of which are deserving of disruption, I wonder whether you would react any more rationally than the London cabdrivers who went on strike to stop Uber, and ended up getting many of their customers to try Uber for the very first time. I operate in the education business, a large and extraordinarily inefficient business, and there is no group more resistant to change and more unprepared to adapt than tenured professors at research university. I cannot wait to see this group, convinced of its intellectual superiority and attached to unreal perks (minuscule teaching loads, research assistants and sabbaticals), go through the throes of disruption. Dream Big or Stay Focused? The Lyft Answer! Dream Big or Stay Focused? Lyft's Counter to Uber! This is the second in a series of three posts on the ride sharing business. In my first, published in both TechCrunch and my blog, I valued Uber, trying to incorporate the news that has come out about the company and its competition in the last year. In this one, I first turn to valuing Lyft, which is telling a narrower, more focused story to investors than Uber and also look at how the pricing ladder in ride sharing companies has pushed up prices across the board. In the last post, due out on Wednesday, I will look at the ride sharing market as a business. In my last post, I valued Uber and admitted that the company has made its way to my list of obsessions. My focus on Uber, though, has meant that I have not paid any attention to the other ride sharing company in the US, Lyft, and I don’t think I have been alone in this process. An unscientific analysis of news stories on ride-sharing companies in the last couple of years suggests that Uber has dominated the coverage of this business. Rather than view this as a slight on Lyft, I would argue that this is at least partially by design, and that it is part of both companies' strategies. Uber is viewed as the hands-down winner of this battle right now, but this is just one battle in a long war and investors define winners differently from corporate strategists. To value Lyft, I will employ the same template that I used for Uber, though the choices I will make in terms of total market, market share, operating margins and risk will all be different, reflecting both Lyft’s smaller scale and more limited ambitions (for the moment). The key differences can be summarized as follows. First, Uber is clearly going after the global market, uninterested in forming alliances or partnerships with local ride sharing companies. Lyft has made explicit its intention to operate in the US, at least for the moment, and that seems to have been precursor to forming alliances (as evidenced by this news story from two weeks ago) with large ride sharing companies in other markets. Within the US, Uber operates in more than twice as many cities as Lyft does. Second, both companies are growing, though Uber is growing at a faster rate than Lyft, and that is captured in both the number of rides and gross billings at the companies. Third, both companies are losing money and significant amounts at that, as they go for higher revenues. Note that, for both companies, the bulk of the information comes from leaked documents, and should therefore considered with skepticism. In addition, there are some numbers that come from press reports (Lyft's loss in 2014) that are more guesses than estimates. The business models of the two companies, at least when it comes to ride sharing, are very similar. Neither owns the cars that are driven under their names and both claim that the drivers are independent contractors. Both companies use the 80:20 split for ride receipts, with 80% staying with the driver and 20% going to the company, but that surface agreement hides the cut throat competition under the surface for both drivers and riders. Both companies offer incentives (think of them as sign-up bonuses) for drivers to start driving for them or, better still, to switch from the other company. They also offer riders discounts, free rides or other incentives to try them or, better still, to switch from the other ride sharing company. At times, both companies have been accused of stepping over the line in trying to get ahead in this game, and Uber’s higher profile and reputation for ruthlessness has made it the more commonly named culprit. The other big operating difference is that unlike Uber, which is attempting to expand its sharing model into the delivery and moving markets, Lyft, at least for the moment, has stayed much more focused on the ride sharing business, and within that business, it has also been less ambitious in expanding its offerings to new cities and new types of car services than Uber. In short, the Lyft narrative is narrower and more focused (on ride sharing and in the US) than the Uber narrative. That puts them at a disadvantage, at least at this stage in the ride sharing market, in terms of both value and pricing, but it could work in their favor as the game unfolds. 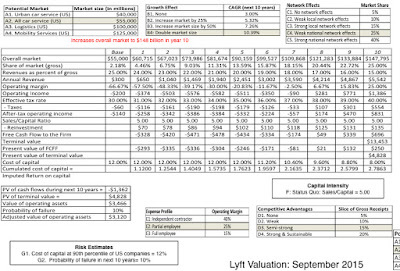 The adjustments to the Lyft valuation, relative to my Uber valuation, are primarily in the total market numbers, but I do make minor adjustments to the other inputs as well. Smaller total market: Rather than use the total global market, as I did for Uber, I focus on just the US portion of these markets. That reduces the total market size substantially. In addition, I assume that, given Lyft’s focus on ride sharing, that its market is constrained to be the US car service market. Notwithstanding these changes in my assumption, the potential market still remains a large one, with my estimate about $150 billion in 2025. National networking benefits: Within the US market, I assume that the increased cost of entry into the business that I referenced in my last post on Uber will restrict new competitors and that Lyft will enjoy networking benefits across the country, enabling it to claim a 25% market share of the US market. Drivers become partial employees: My assumptions on drivers becoming partial employees and competition driving down the ride sharing company slice of revenues will parallel the ones that I made for Uber, resulting in lower operating margins (25% in steady state) and a smaller slice of revenues (15%). Lyft is riskier than Uber: Finally, I will assume that Lyft is riskier than Uber, given its smaller size and lower cash reserves, and set its cost of capital at 12%, in the 90th percentile of US companies, and allow for 10% chance that the company will not make it. The value that I get for Lyft is $3.1 billion, less than one seventh of the value that I estimated for Uber ($23.4 billion) in my last post. The biggest danger that I see for investors in Lyft is that the company has to survive the near future, where the pressure from Uber and the nature of the ride sharing business will create hundreds of millions of dollars more in losses. If the capital market, which has been accommodating so far, dries up, Lyft faces the real danger of not making it to ride sharing nirvana. It is a concern amplified by Mark Shurtleff at Green Wheels Mobility Solutions, a long-time expert and consultant in the ride sharing and mobility business, who points to Lyft's concentration in a few cities and cash burn as potential danger signs. While none of the ride sharing companies are publicly traded and there are therefore no prices (yet) for me to compare these valuations to, there have been investments in these companies that can be extrapolated at some risk to estimate what these investors are pricing these companies at. In keeping with my theme that price and value come from different processes, recognize that these are prices, not values. I took at look the most recent VC investments in ride sharing companies and what prices they translate into. The danger in extrapolating VC investments to overall value, which is what the press stories that report the overall prices do, is that the only time that a VC investment can be scaled up directly to overall value is if it comes with no strings attached. Adding protections (ratchets) or sweeteners can very quickly alter the relationship, as I noted in this post on unicorns. * The revenues are estimated using the revenue slice that these companies report, but with customer give aways and other marketing costs, the actual revenues were probably lower. On a pure pricing basis, Lyft looks cheap on every pricing multiple, and Uber looks expensive on each one, perhaps providing some perspective on why Carl Icahn found Lyft to be a bargain, relative to Uber. Didi Kuaidi looks expensive on any measure other than gross billing and GrabTaxi looks cheap on some measures and expensive on others. It is worth noting that these companies have different revenue models, with Lyft and Uber hewing to the 20% slice model, established in the US and Ola (which has more of a taxi aggregating model), at least according to the reports I read, follows the same policy. BlaBla is mostly long-distance rides and gets about 10-12% of the gross billing as revenue, GrabTaxi gets only 5-10% of gross billings, Didi Kuaidi, which had its origins in a taxi hailing app, gets no share of a big chunk of its revenues and BlaBlaCar derives its revenues more from long distance city-to-city traffic than from within city car service. Given how small the sample is and how few transactions have actually occurred, I will not attempt to over analyze these numbers, other than wondering, based on my post on corporate names, how much more an umlaut would have added to Über's hefty price. With all of these companies, the prices paid have risen dramatically in the last year and a half and I believe that this pricing ladder is driven by Uber's success at raising capital. In fact, as Uber's estimated price has risen from $10 billion early in 2014 to $17 billion last June to $40 billion at the start of 2015 to $51 billion this summer, it has ratcheted up the values for all of the other companies in this space. That should not be surprising, since the pricing game almost always is played out this way, with investors watching each other rather than the numbers. As with all pricing games, the danger is that a drop in Uber's pricing will ratchet down the ladder, causing a mark down in everyone's prices. If narrative drives numbers and value, which is the argument that I have made in valuing Uber and Lyft in these last two posts, the contrast between the two is also in their narratives. Uber is a big narrative company, presenting itself as a sharing company that can succeed in different markets and across countries. Giving credit where it is due, Travis Kalanick, Uber’s CEO, has been disciplined in staying true to this narrative, and acting consistently. Lyft, on the other hand, seems to have consciously chosen a smaller, more focused narrative, staying with the story that it is a car service company and further narrowing its react, by restricting itself the US. The advantage of a big narrative is that, if you can convince investors that it is feasible and reachable, it will deliver a higher value for the company, as is evidenced by the $23.4 billion value that I estimated for Uber. It is even more important in the pricing game, especially when investors have very few concrete metrics to attach to the price. Thus, it is the two biggest market companies, Uber and Didi Kuaidi, which command the highest prices. Big narratives do come with costs, and it those costs that may dissuade companies from going for them. It can distract: Big narratives will require companies to deliver on multiple measures and that may distract management from more immediate needs. It can be costly: Having to grow faster and in multiple markets (different businesses and different geographies) at the same time will be more costly than focusing on a smaller market and having more measured ambitions. It can create disappointments: The flip side of convincing investors that you can reach for the heights is that if you don’t make it, you will disappoint them, no matter how good your numbers may be. With Uber, you see the pluses and minuses of a big narrative. It is possible that Uber Eats (Uber’s food delivery service), UberCargo (moving) and UberRush (delivery) are all investments that Uber had to make now, to keep its narrative going, but it is also possible that these are distractions at a moment when the ride sharing market, which remains Uber’s heart and soul, is heating up. It is undoubtedly true that Uber, while growing at exponential rates, is also spending money at those same rates to keep its big growth going and it is not only likely, but a certainty, that Uber will disappoint their investors at some time, simply because expectations have been set so high. It is perhaps to avoid these risks that Lyft has consciously pushed a smaller narrative to investors, focused on one business (ride sharing) and one market (the US). It is avoiding the distractions, the costs and the disappointments of the big narrative companies, but at a cost. Not only will it cede the limelight and excitement to Uber, but that may lead it to be both valued and priced less than Uber. Uber has used its large value and access to capital as a bludgeon to go after Lyft, in its strongest markets. As an investor, there is nothing inherently good or bad about either big or small narratives, and a company cannot become a good investment just because of its narrative choice. Thus, Uber, as a big narrative company, commands a higher valuation ($23.4 billion) but it is priced even more highly ($51 billion). Lyft, as a small narrative company, has a much lower value ($3.1 billion) but is priced at a lower number ($2.5 billion). At these prices, as I see it, Lyft is a better investment than Uber. It is clear that Uber and Lyft have very different corporate personas and visions for the future and that some of the difference is for outside consumption. It serves Uber well, in its disruptive role, to be viewed as a bit of a bully who will not walk away from a fight, just as it is Lyft’s best interests to portray itself as the gentler, more humane face of ride sharing. Some of the difference, though, is management culture, with Uber drawing from a very different pool of decision-makers than Lyft does. If this were a bicycle race, Uber reminds me of the aggressive lead rider, intent on blocking the rest of the pack and getting to the finish line first, and Lyft is the lower profile racer who rides just behind the leader, using the draft to save energy for the final push. This is going to be a long race, and I have a feeling that its contours will change as the finish line approaches, but whatever happens, it is going to be fun to watch! 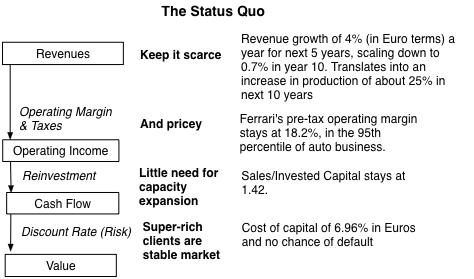 The Ferrari IPO: A Price Premium for the Prancing Horse? I live in a prosperous suburb, sustained largely by financial service businesses, but as far I know, there is only one Ferrari in my town. Much of the week, the car sits in a garage which has its own security system, more secure than the one protecting its owner's house, and on a nice weekend, you see the owner drive it around town. It is a remarkably inefficient transportation mode, too fast for suburban roads, too expensive to be parked at a grocery story or pharmacy, and too cramped for car pool. All of this comes to mind, for two reasons. The first is the imminent initial public offering of the company, with all the pomp and circumstance that surrounds a high-profile offering. The second is that this offering has set in motion the usual talk of brand names and the price premiums that we should pay to partake for investing in them. The Ferrari story started with Enzo Ferrari, a racing car enthusiast, starting Scuderia Ferrari in 1929, to assist and sponsor race car drivers driving Alfa Romeos. While Enzo manufactured his first racing car (Tipo 815) in 1940, Ferrari as a car making company was founded in 1947, with its manufacturing facilities in Maranello in Italy. For much of its early existence, it was privately owned by the Ferrari family, though it is said that Enzo viewed it primarily as a racing car company that happened to sell cars to the public. In the mid-1960s, in financial trouble, Enzo Ferrari sold a 50% stake in the company to Fiat. That holding was subsequently increased to 90% in 1988 (with the Ferrari family retaining the remaining 10%). Since then, the company has been a small, albeit a very profitable, piece of Fiat (and FCA). The company acquired its legendary status on the race tracks, and holds the record for most wins (221) in Formula 1 races in history. Reflecting this history, Ferrari still generates revenues from Formula 1 racing, with its share amounting to $67 million in 2014. Much as this may pain car enthusiasts everywhere, some of Ferrari's standing comes from its connection to celebrities. From Thor Batista to Justin Bieber to Kylie Jenner, the Ferrari has been an instrument of misbehavior for wealthy celebrities all over the world. 1. 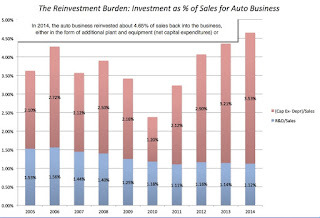 It is a low growth business: The auto business is a cyclical one, with ups and downs that reflect economic cycles, but even allowing for this cyclicality, the business is a mature one. 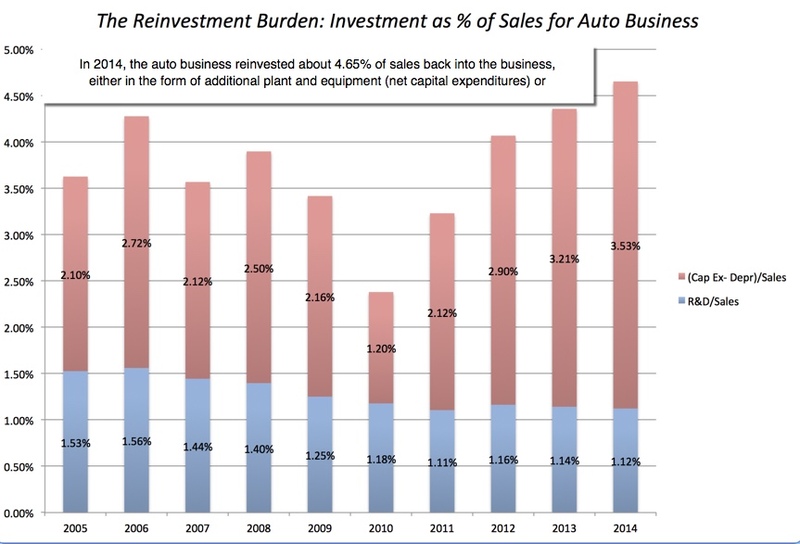 That is reflected in the growth rate in revenues at auto companies. During this period, the emerging market economies in Asia and Latin America provided a significant boost to sales, but even with that boost, the compounded annual growth rate in aggregate revenues at auto companies between 2005 and 2014 was only 5.63%. 2. 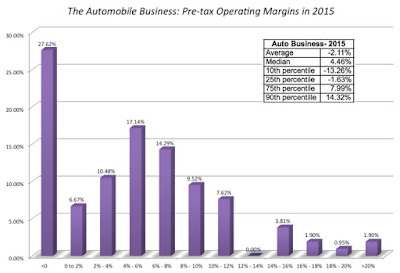 With poor profit margins: A key point that Mr. Marchionne made about the auto business is that operating margins of companies in this business were much too slim, given their cost structures. 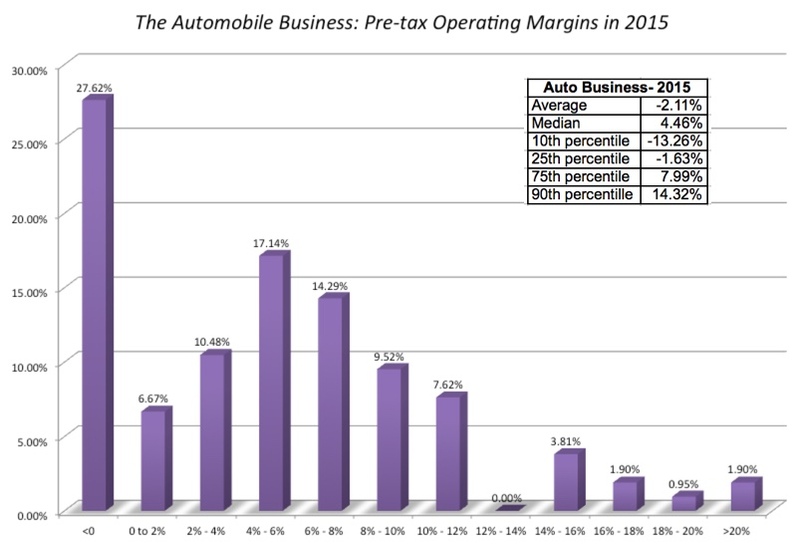 To illustrate this point (and to set up my valuation of Ferrari), I computed the pre-tax operating margins of all auto companies globally, with market capitalizations exceeding $1 billion, and the graph below summarizes my findings. Styling: I am not a car lover, but even I can recognize that a Ferrari is a work of art. That is not accidental, since the company spends substantial amounts on styling and the little details that go into every Ferrari. Speed: There is no absolutely no chance that you will test the upper limits of the car's engine capacity, but you could get from LA to San Francisco in about 3 hours, if you could maintain the car at its top speed (I am not recommending this). So, if you grew up with dreams of being a Formula 1 driver, and now have the money to fulfill them, a Ferrari is probably as close as you are going to get to these dreams. Story: The car comes with a story that draws as much from its celebrity connections as it does from its speed exploits. Scarcity: Notwithstanding the first three points, it would be just another luxury car if everyone had one. So, it has to be kept scarce to command the prices that it does, both as a new car and in its used versions. Note that a significant slice of the revenue pie comes the Middle East and that Ferrari, like many other global companies, is becoming increasingly dependent on China for growth. The story: Ferrari remains a extra-exclusive automobile company, keeping production low and prices high. The benefits of this strategy are high operating margins (Ferrari has among the highest in the auto business) partly because of the high prices, and partly because the company does not have to spend much on expensive ad campaigns or selling. It also will keep reinvestment needs to a minimum, since capacity expansion will not be necessary, though the company will continue spending on R&D to preserve its edge (on speed and styling). 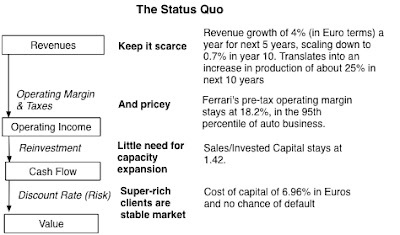 In addition, by focusing on a very small group of super rich people around the world, Ferrari may be less affected by macroeconomic forces than other luxury auto companies. The valuation: With these assumptions, the value for equity of 6,310 million Euros (approximately $7 billion). You can download the spreadsheet here. The story: Ferrari tries to broaden its customer base, perhaps by introducing a lower-priced version; this would mirror what Maserati did with its Ghibli model. That will allow for higher revenue growth but like Maserati, Ferrari will have to yield some of its operating margin, since this strategy will require lower prices and higher selling costs. Seeking a larger market will also expose it to more market risk, pushing its cost of capital in high growth to 8.5% and its cost of capital beyond to 7.5%. The inputs: This strategy will generate higher sales (doubling number of units sold in next ten years) but at the expense of lower margins (from lower prices and higher selling costs) and higher risk (as the clientele will be more sensitive to economic conditions). The valuation: With this strategy, the value for equity of 6,042 million Euros (approximately $6.75 billion). You can download the spreadsheet here. 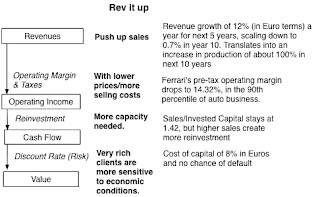 At least based on my estimates, it is more sensible for Ferrari to stick with its low-growth, high price strategy and keep itself above the fray of the auto business, a bad business where most companies seem to have a tough time earning their cost of capital. 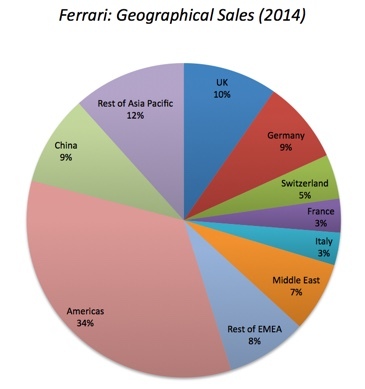 EV/Sales 2.10 0.94 Ferrari's operating margin is 18.2% versus Industry average of 6.58%. EV/EBITDA 12.57 9.05 Ferrari EBITDA/Invested capital is 15.68% versus Industry average of 14.45%. PE 22.87 10.00 Ferrari has a debt ratio of 9.43% versus Industry average of 39.06%. 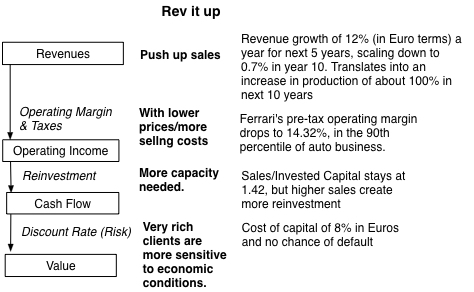 Thus, the intrinsic value estimates already are building in a hefty premium for the effects that Ferrari's brand name has on its operating margins and return on capital. Is it possible that the brand name can be utilized better? That is always possible but there is nothing to indicate that the brand is being mismanaged or that it can be easily exploited to generate additional value. In fact, the consolidation of voting power in the hands of the existing owners suggests that there the firm will remain largely unchanged after the IPO. An initial public offering does create a host of issues that can affect valuation, sometimes tangentially and sometimes directly. In the case of Ferrari, the three issues that merit the most attention are whether the proceeds from the offering will affect value, what the value per share will be, and how the augmentation of voting rights for the existing stockholders will play out. Use of proceeds: The proceeds from an IPO can have a feedback effect on value, but only if the IPO proceeds are kept in the firm to cover current or future investment needs. In this IPO, the billion dollars expected to be raised from the offering will go to Fiat for cashing out some of its ownership stake, and thus not benefit Ferrari stockholders. There is therefore no need to add these proceeds back to the cash balance (as I would have, if the IPO proceeds had been retained by the firm). Number of shares/IPO price per share: Note that in both my valuations, I have focused on the value of equity, rather than a per share value, for two reasons. The first is that the number of shares is still in flux (notice all the empty spaces in the prospectus). The second is that the per share value will be a function of the number of shares created in the company. Thus, if the value of equity is 6.3 billion Euros, Ferrari can create 100 million shares at 63 Euros per share or 2 billion shares at 3.15 Euros per share, with the same end result. The number of units and offering price will be set jointly, because setting one will also determine the other. The talk of the town is that the company will be valued at 50 Euros per share and the value of equity will be 10 billion Euros. At least based on those rumors, it seems like the Ferrari will create 200 million shares, and if that is the correct number, the value per share that I arrive at is about 31.5 Euros per share (based on my 6.3 billion Euro status quo value). Control: After the IPO, Ferrari will become an independent firm but control will still remain concentrated in the hands of its current owners, Fiat and the Ferrari family. In fact, the existing owners will get twice the voting rights on their shares, relative to the those who buy shares in the IPO, for their loyalty. The two big owners, Exor (the investment fund for the Agnelli family) and the Ferrari family will control 49% (Update: I erroneously stated the they would control 51% of the voting rights, but with the rest of the holdings dispersed, that is effectively majority control) of the voting rights with about 33% of the shares. The shares that you and I will have a chance to buy at the IPO will be the low-voting right shares, I guess because we are disloyal investors. I don't see much of a discount on these shares since even without the additional voting rights, it is unlikely that anyone can force the company to change its operations, if that change is against the wishes of the Agnelli/Ferrari clan. It will be interesting to see this game play out, as the offering gets closer. There is a push to attach a valuation of 11 billion Euros for the Ferrari shares, both because it will get more cash for Fiat from the offering, and more importantly, because the increased value of its remaining holdings in Ferrari will then feed into Fiat's market capitalization. The push may succeed because investors seem eager to buy these shares, at least according to this story, and the price premium will be justified with the argument that Ferrari is a premium brand that caters to the rich. Off to the races!